Since 2005, Alamo Infrared has been an independent service provider of high quality thermal imaging for the power, oil & gas, industrial, building trades and real estate markets. Recently, working through the night during the Unit 2 rebuild at a nuclear generating station we found defects or anomalies that ELCID previously passed right over. In fact, the ELCID testing is always performed prior to us arriving on site. Utilizing multiple cameras and camera angles we consistently discover unknown imperfections and breakdowns in the inter-laminar insulation. Our new HD thermal imagers can detect and identify shorted laminations usually within the first 30 minutes into the flux test. 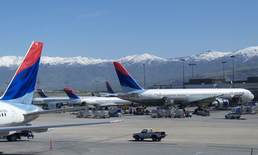 Salt Lake City International Airport is the most 'on time' airport in North America with over 750 flights per day. Non stop international flights to Asia and Europe depart daily. As a major Delta hub, SLC boasts daily flights to 95 nonstop destinations. Our equipment is customs cleared, calibrated and packed in hard travel cases. Whatever your infrared thermal imaging needs require, from planned outages and repairs to emergency situations, we are your one source solution. Our pricing is pleasantly affordable, you will be surprised!